The Will-To-Be Best Typing Game ever in Golang! Noted: This is for now a one-player client player which you can only play locally. It is a Proof-of-Concept (POC). After contest, it will be extended to multiplayer via network where we have main server to match each player together and have skills where each player can attack the other side. 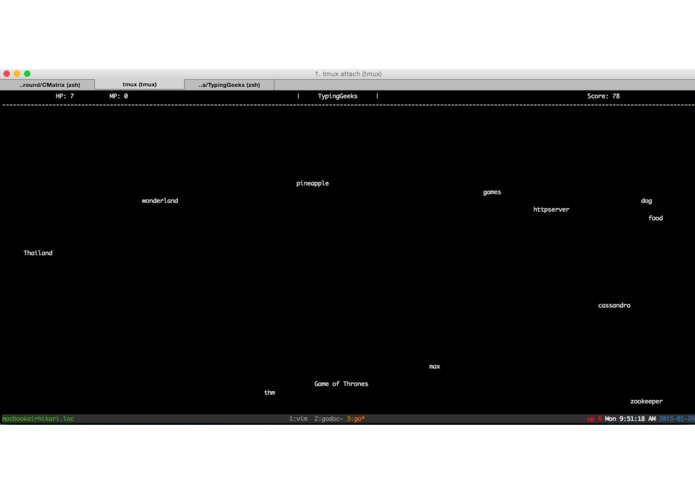 TypingGeeks will be a peer-to-peer typing game based on Terminal targeting on people who love & always work with Terminal. The game can be portable anywhere that have Terminal whether on your local machine, enterprise server, or your server on the cloud but not only limited to these. It will also be designed to be modular and communication via network procotol that anyone will be able to design and create a new TypingGeeks game on any platform such as native app or web service with high graphics. That means a player who plays on Terminal will be able to compete with another player on web browser w/o any difference. With this mini-game, developers can use it to relax during work 5-10 mins and gain more efficiency after playing it. Each player has HP, MP and skills they can use to attack the other player. Only one game, one stage, play until the other side dies with HP zero. Go routines for all parts: Threading wouldn't become easier than this! Ease of deployment: just one file, you can just put on any server, cloud, or your local machine and PLAY!